When on times that you just wanna revert from the start because you installed some apps and it messed up your S8, you hard reset it. Here’s how you can hard reset your Samsung Galaxy S8. It is important that you wait a few seconds for your phone to completely and properly shut down. Go into Samsung Galaxy S8 recovery mode by pressing and holding VOLUME UP, BIXBY and POWER buttons all at the same time. Release all three buttons when Samsung Galaxy S8 screen flickers and you see a warning sign. Use VOLUME button to navigate. Use POWER button to select an option in Recovery mode. If you’re already in the main menu, use the VOLUME button to select WIPE DATA FACTORY RESET. Select YES using POWER button to confirm. If you want to delete app data cache after deleting partition, choose WIPE CACHE PARTITION. This can solve problems related to stock and/or installed software. Restart your phone by choosing REBOOT SYSTEM NOW just by pressing the POWER button. After hard resetting your Samsung Galaxy S8, you will need to set it up again. Click the button to learn more about the features of the new Samsung Galaxy S8. 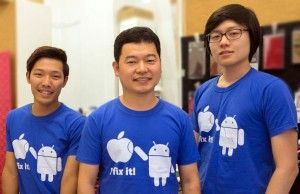 Let the Sydney CBD Repair Centre Team help you reset your Galaxy S8! We specialize in Screen Replacement services.